If your tooth is damaged (but not lost) or if you had root canal treatment, a dental crown can be used to restore your tooth’s shape, function, and appearance. This is an artificial tooth used by Tijuana dentists to cover decayed or damaged tooth not only to restore it but also to protect it from external factors that can lead to further damage. In addition, they are also often used to cover misshapen or discolored tooth. 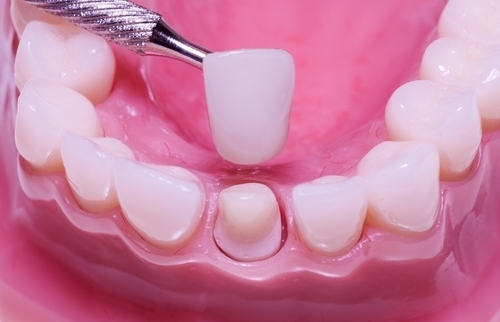 A tooth that has been efficiently fixed with a crown can very much work and look like a natural tooth. 1.- PFM porcelain – PFM, which stands for porcelain fused to metal restorations have always been the standard in restorative dentistry for more than 30 years. They became popular to dentists as well as patients because of their versatility and their ability to match the surrounding teeth. PFM porcelains are made by bonding the porcelain to a metal cap or shell. Here at Samaritan International, we make two versions of PFM depending on the location of the tooth that needs to be crowned. Metal margin is recommended for rear molars because they are thinner and they slide under the edge of the gum much easier. On the other hand, we recommend collarless porcelain margins for front teeth, which are visible when you smile or when you speak. This covers the margins of the crown completely so you don’t have to worry about those embarrassing dark lines on the edge of your gum. PFM restorations are highly recommended for patients who are looking for aesthetically appealing crown that are durable and versatile. They are especially beneficial if you’re suffering with bruxism. 2.- E.Max Crowns – This are all-ceramic dental crowns that are considered a major breakthrough in the field of cosmetic and restorative dentistry. Combining high aesthetics and superior strength, E.Max Crowns are fast becoming the number one option of those people who required dental crowns in Tijuana Mexico. These crowns are made from the same material as veneers; the only difference is that they cover the entire tooth. Samaritan International recommends the use of E.Max Crowns for front teeth. 3.- Zirconium Crowns – Also called as Zirconia, this type of crown is becoming the material of choice for us here in Tijuana Mexico. Made from very strong and durable material, they are designed to withstand the wear and tear of everyday use. Just like E.max Crowns, Zirconium Crowns also have very nice aesthetic effect but they are stronger. They are also translucent very similar to a natural tooth. For this reason, they are highly recommended for front teeth. To cover a dental implant, severely discolored or misshapened teeth. 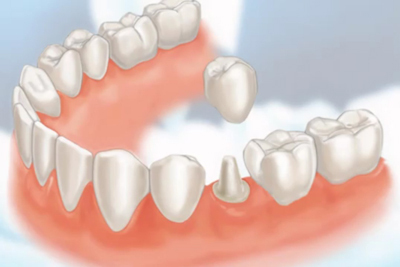 The procedure for getting a dental crown begins with numbing the tooth using local anesthesia. If the tooth had root canal treatment or has been fractured, your Mexican dentist will need to restore it first and give the crown a filling that it can hold on to. The tooth is then reshaped to support the crown. An impression will be made and this will be sent to a dental lab. But before that, your Tijuana dentist will determine the shade of your teeth to guide the lab technicians in making the crown that will match the rest of your teeth. Until the permanent crown is ready, a temporary crown made from acrylic or resin material will be used. Here at Samaritan International, we understand that Americans who are here to take advantage of Mexico’s growing dental tourism are typically pressed for time. For this reason, we make necessary adjustments for your convenience. By making prior arrangement before you fly here, we can take an extra mile and speed up the process of making the permanent crown so you will not have to go back and forth. It is our goal to help you get the best dental care as well as help you save money while doing so.